Join our Cardiff Half Marathon team and 18,000 others in a race through the Welsh capital. The Cardiff Half Marathon has grown into one of the largest road races in the UK, taking you through the beautiful scenery and historic buildings of the city centre. The route will take you past some of the Welsh capital's most iconic landmarks, with stunning scenery and beautiful buildings. Along the way you will pass the glorious Penarth Marina before crossing the barrage and heading to Cardiff Bay, where you will run right through the heart of the bay taking in the Norwegian Church and the Wales Millenium Centre. The flat roads along this course make this the perfect race for experienced and novice runners alike. Age Criteria: Half marathon entrants must be 17 years or older on the day of the race. Younger runners can take part in the Family Fun Run and Toddler Dash as part of the Festival of Running on Saturday 5th October. The race starts outside Cardiff Castle on Castle Street at 10am. The race will finish on King Edward VII Avenue. The race village is at City Hall Lawn outside Cardiff’s City Hall. Baggage AreaThe baggage tents will be open at 8.30am. They are located on Museum Avenue and in the museum car park near the Runners’ Village. Please refer to the village and baggage map in this brochure for an exact location. All runners are allowed to deposit one bag which must display your baggage label, which is a tear-off strip on the bottom of your race number. Please attach the label before your arrival. Bags can be collected after the race upon receipt of your runner number. Only runners and staff will have access to this area which will be manned by security staff who may ask to check your bags.Items not collected after baggage closure will be held at the Event Information tent in the Runners’ Village. The following day they will be taken to the Run 4 Wales offices. In 2017, a park and walk facility was be provided at the Cardiff City Football Stadium car park on Leckwith Road, Cardiff, CF11 8AZ. This year’s parking details will be released closer to the day. Go green and travel by bike to the start of the race. Lock your bike up in our bike park in the Runners’ Village and avoid the stresses and strains of race day traffic and parking. When watching the race please be aware of the course and stay behind barriers at all times. Crossing points will be managed throughout the course, but when none are available, please take great care in not crossing in front of runners and cross when there are no runners on the road. There are a number of brilliant locations around the route to watch the race, but please take care at all times. Q.What will I receive before the race? A. All runners who have been accepted into the race will be sent a race pack by post which will include important race information, race number and timing chip. This will arrive around 1-2 weeks before the race. Q. When will my race pack arrive? A. Finishers’ t-shirts will be given out on completion of the race. A medal and a goody bag will also be given out separately. A. Avoid using headphones whilst running to limit the risk of injury to yourself and other participants. The Organiser will not be held responsible for incidents caused as a result of the use of headphones which inhibit the communication of important warnings or information from emergency services or course marshals. A. 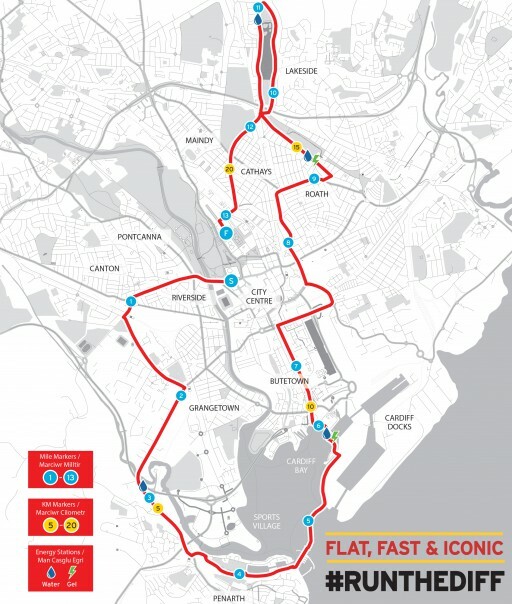 Full details of all road closures will be included in your race pack and will be available on the Cardiff Half Marathon website. Your timing chip will be embedded in your runner number. Please remember to bring your runner number with you on the day as these cannot be re-issued. Please ensure your runner number is safely and clearly pinned to the FRONT of your vest or t-shirt. There will be several toilets positioned within the first mile (urination on the street will result in disqualification and a ban from the event in future). Race officials will be monitoring for offenders. Male and female changing areas will be on offer at the north end of our baggage tents on Museum Avenue. Shower facilities will be available at Sports Wales in Sophia Gardens for a £1 charity donation. A really great event, loads of other runners and plenty of water stations. Would recommend not just accepting the lucozade because it's free if you haven't trained with sports drinks. I felt very sick! Not much incline, great route taking out over the barrage to see both the bay and Bristol Channel. Absolutely brilliant race and awesome atmosphere. No matter where you were on the course there was always an abundance of support, from the handmade signs, to high fives, to handing out jelly sweets. Course was relatively flat with only a few gradual hill climbs. Best part of the race would probably be running through Cardiff Bay, the views were great. Definitely recommend especially for those who are first timers to a half marathon, there are people of all caliber who run it. The reinstated race - along with a new 10k run - will start at 11am Minehead esplanade and follow a looped circular route which has been marked out so that the runners will be going in opposite directions, increasing the fun for participants and spectators alike. All proceeds will go to Elliots Touch, a Watchet-based charity which aims to raise awareness of mitochondria disease and genetic heart disease in babies and infants. The Bridgwater Half Marathon, in aid of Cancer Research, features a Half Marathon, 10k and 5k route. Expect over 200 runners showing their support for Cancer Research UK by pounding the pavement for this event. The 5k Fun Run is popular with families and fundraisers alike. The run is organised by Bridgwater and District Friends of Cancer Research UK and Bridgwater's own Ramblers Carnival Club.